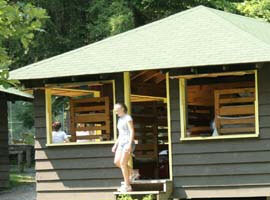 Camp Oneka has three living areas that are divided by grade in school. The youngest campers, from age 6 years old to completed 5th grade (entering 6th grade) live in junior row. The cabins are fully enclosed, with electricity, and a bathroom. The girls sleep in bunk beds. There are usually six girls in a cabin with one and most times two counselors, who sleep in the cabin with them. The Junior showers are in a separate, nearby building with private showers and hot water. Girls completed 6th and 7th grade (entering 7th and 8th grade) live in intermediate row. These bright airy cabins also have electricity, a bathroom, and a walk-in closet for storage. 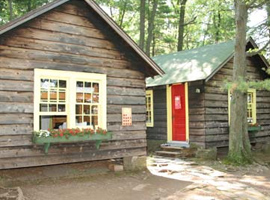 Each cabin accommodates six girls and a counselor. The “Ints” have their own showerhouse with private showers and hot water. The cabins are located on the shore of the lake in a lovely cove, and the girls enjoy spectacular sunsets from their dock. Girls completed 8th, 9th, or 10th grade (entering 9th, 10th and 11th grade) live in senior row. 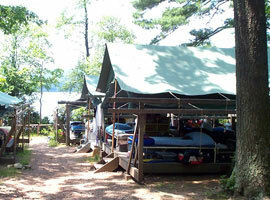 Seniors love their large, dry, airy tents on the shore of the lake. Girls sleep in single beds and each tent is equiped with an electric light, and has a wooden floor which is off the ground. The senior showershouse is equipped with sinks, flushing toilets, and private showers. A counselor lives in the tent with the campers.